Kansans, we have been riding an income tax roller coaster! 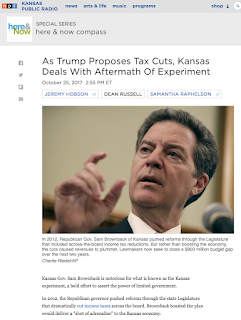 In 2012 the "Kansas experiment" brought lowered income tax rates and a full tax exemption for business income. Last June those policies were rescinded. Income taxes went down, then up. Some have been calling the June tax changes the biggest tax increase in Kansas history, completely ignoring what has happened in Kansas over the last 5 years. True, people with business income must now pay tax, but that just brings things back to the way they were before the experiment. Yes, income tax rates have moved higher, but they still remain below 2012 levels. When a bipartisan supermajority of legislators overrode Gov. Brownback's tax bill veto in June, they did not have a realistic alternative. Kansas was broke. For the whole period of the tax cuts, Kansas lacked enough revenue to pay bills. A promise of economic prosperity created by tax cuts had instead turned into a lingering budget disaster. Think about what might have been possible these last 5 years if lawmakers had not put Kansas into that tax roller coaster car, if income tax policy had just been left alone in 2012. Our political energy could have focused on future progress rather than crisis management. Public education could have been adequately funded rather than put at risk. Instead of cancelling highway projects, new jobs could have been created to maintain roads and bridges. Kansas could have moved confidently forward to expand Medicaid eligibility, attracting billions in federal matching dollars and providing health insurance to thousands. And the onerous sales tax increase of 2015 which pushed the Kansas sales tax on food to the highest in the nation, would not have occurred. A temporary increase in the sales tax which helped Kansas through the Great Recession was set to expire in 2014. Instead, Gov. Brownback and his legislative allies made the temporary rate permanent and added yet another increase on top, all to offset a small piece of the income tax cuts. The lawmakers who overrode Brownback were courageous and acted in the best interests of Kansas, but they have a lot more to do. Ending the tax experiment stabilized Kansas financially and started to turn things around. But during the experiment, Kansas spent all its reserves, and now the state needs to build back a rainy day fund. Lawmakers also ran up the state debt, and now will have to make payments. The budgets of state agencies, hospitals, and prisons were squeezed hard, and the results of that-a decertified hospital and prison riots-need to be remedied. Kansas has endured a load of financial trouble and national shame. The most positive thing that can be said about our experience is that we acquired some education. We learned that our experiment in trickle-down economics did not work. Kansas tax policy should have stayed practical, realistic, and flat like our geography. But that's not what happened. So now we must repair the damage and resolve not to get on the roller coaster again. —Duane Goossen formerly served 12 years as Kansas Budget Director.